Looking for some more fun things to do this summer? 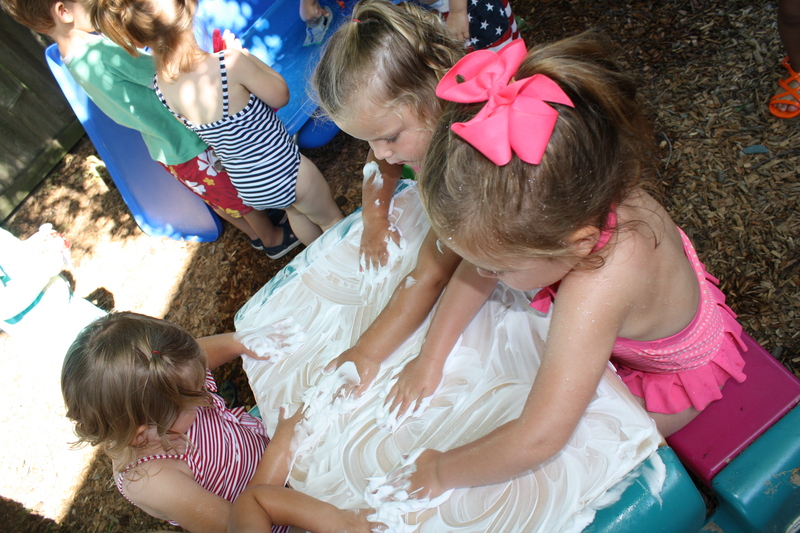 One of my girls’ absolute favorite things to do in the summer is shaving cream! We use the cheap Barbisol ones that cost $1 at the Dollar Tree and we make memories! Papa even participated last year! We investigate with shaving cream at school too! 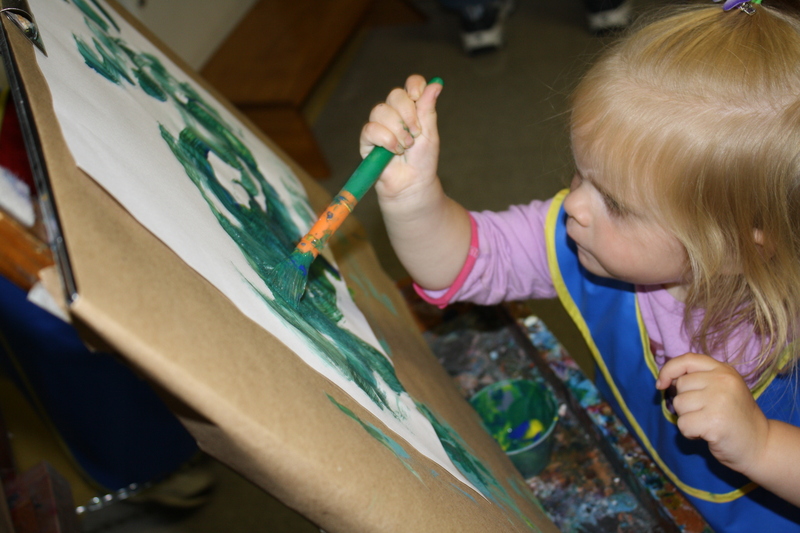 It’s a sensory activity that children love. The way it feels, smells, and how easily we can manipulate it with our hands are all so fun! And when a big enough mess has been made, we can hose it off! And when children investigate, they are being creative! Creativity is something that I value so much! It’s always fascinating to watch a child create. Speaking of creativity, there’s an art festival going on this weekend in Olathe. We attended last year as a family. Remember how I told you that I appreciate things that are not crowded and are easy? This is one of those things. We walked around, ate snow cones, talked to artists, looked at art and even participated! And when we got tired and hot, we went home! Click on the picture above for more information! *create a collage (gather a bunch of materials: paper scraps, buttons, doilies, cupcake liners) and create! Do you have other activities that you enjoy doing with your children? Have you gone out and attended any of the events that I’ve posted about? I would love to hear from you and share some of your stories and pictures! 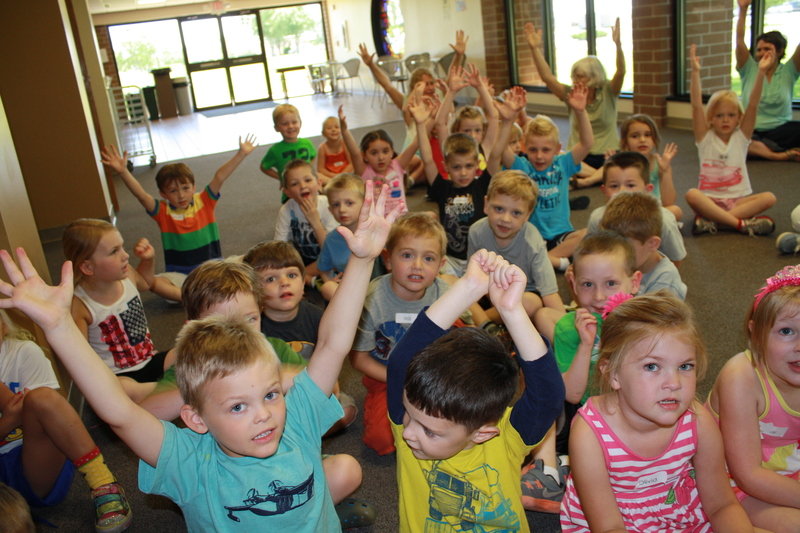 Feel free to drop us a line at preschool@aldersgateumc-ks.org and we’ll share your pictures and stories on the blog! Categories: Parenting, Play | Permalink. People are social creatures. As infants one of the most important things we do is form attachments to others. Without social attachment children often fail to thrive. Then in early childhood years, children begin to seek out others to add to their circle of close relationships, they look for friends. Social skills are important in all aspects of life. In fact, many highly successful people will include social skills first, or at least very high, on their list of qualities that contribute to success as adults. 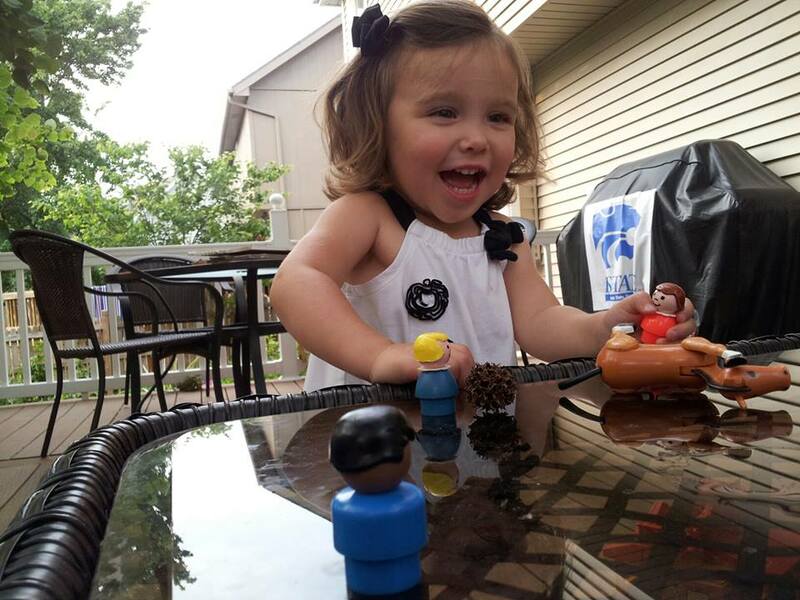 We, at Aldersgate Preschool, are intentionally looking for opportunities to “teach” positive social interaction. Often we can sneak in some teaching moments in the midst of our play. You can too. From a very early age my daughter, Allie, and I have modeled to Anna, my grand-daughter, ways to give toy animals or people a voice, a story. I remember Anna’s huge smile the first time I had her baby doll clap and cheer for her as she accomplished a new skill. Anna loved the idea that her baby was watching and cheering for her. She then spent quite a bit of time learning how to help her baby clap. With this new skill in place Anna began to recognize moments that might cause feelings of excitement for her baby. She would happily help her baby clap for others then. Anna was learning an important social skill, empathy: the ability to understand and share the feelings of others. This weekend Anna asked, “Play with Anna, Grammy, please?” As you can imagine we were soon playing together. She loves the old Fisher Price people sets that I have from our own children’s early years. This day we were playing with the Western Town but really it could have been any of them. It’s the people that bring the sets to life. To personalize them, we have given some people names of family members based on their similar physical traits. As we played, my person “walked” to my daughter’s person and said, “Hi, can I play with you please?” Allie had her person turn toward mine and she replied, “Sure, you can play. What should we play?” There was a little sticky ball laying by our pieces so I said, “Hey, let’s kick the ball.” “Okay” she replied and we made our people push the ball toward each other. Anna giggled and then quickly brought her little person over to play. We helped her with the words to ask to join our play and of course we welcomed her person into the game. Through this seemingly simple activities we introduced many different skills and gave Anna an opportunity to practice them. Anna now has this experience to refer to when trying to play with others at story hour, church and other social situations. The National School Association of Psychologists states the following: Good social skills are critical to successful functioning in life. These skills enable us to know what to say, how to make good choices, and how to behave in diverse situations. The extent to which children and adolescents possess good social skills can influence their academic performance, behavior, social and family relationships, and involvement in extracurricular activities. So I say, take some time to play! Your child will cherish the moment and in the midst of the play you can guide and model positive social skills, give labels to different feelings, practice skills that may be difficult for your child and so much more. Categories: Child Development, Parenting, Play | Permalink. Farmer’s Market: Music, Food, and Splashing! I’ve heard from several families who visited the strawberry patch and had a great time! I loved hearing about it! Are you looking for some more ideas? If you missed strawberry picking, don’t fret because blueberry season is upon us! Our favorite place to go is the Berry Patch. I highly recommend checking their picking report before you go! Another one of my favorite things to do with children during the summer is Farmer’s Market. Besides actually going out and picking the fruits, what could be better than buying fresh? I have found, too, that my children are more likely to try out a new fruit or vegetable when they pick it out at a farmer’s market. My personal favorite one is Overland Park Farmer’s Market. If you click on the picture below, you’ll find a list of events that occur weekly. The market is open on Wednesday and Saturday mornings. In case you’re wondering why it’s my favorite, let me share. *The market is very easily accessible (does not require a ton of walking-yea! for those whose kids get hot and tire easily). I love things that I can take my family to that aren’t “an event” to attend. Ya know what I mean? It’s fun, laid back, and totally do-able. And if you get there and find that things aren’t going so well (kids are grouchy, you’re grouchy, etc) you can duck out easily. *There is a miniature fountain for the kids to play in (they enjoy getting their feet wet and splashing around). *I love downtown Overland Park. Our favorite pizza place is Papa Keno’s (pizza slices as big as your face). There’s a new craft place for kids called Kookiedoodle Crafts and you can drop in anytime and get creative! Summer Camp has begun and it is so wonderful to see some of our families again! Our camp theme is “Everything is Growing” and we are learning all about things that grow; from our own bodies to insects and worms to seeds and plants! Special thanks to Ms. Lori for creating this fun and creative curriculum! Ms. Cyndi is taking a well deserved break this summer and meanwhile, we are missing her lovely guitar tunes and the beautiful music that she shares and teaches us. My own musical skills are lacking. I don’t play an instrument and my voice isn’t the most wonderful thing to listen to but you know what I’ve found? The children don’t care! They just love to sing and move! So I thought I would share a few of the songs that we are doing this summer. Perhaps you can do some at home together. The children really enjoy Eric Hermann’s “Ants in Your Pants.” My daughter did this with her kindergarten class as a “brain break.” Hmmm…. you know those times at home when things get a bit crazy? I wonder what would happen if you just dropped everything and played this? Eric Hermann has another really fun song on youtube called “Elephants” if you’d like to check that out too. Parenting is a tricky enterprise. Often we struggle knowing just how to balance things. Plan for open play time * Offer your child a chance to try new activities like soccer, dance, . . .
It’s this last thought that Amanda Morgan, author of the Not Just Cute blog, addresses in her latest post. You can find that post here. I like to surf the net looking at different parenting, decorating, crafting blogs, etc. With the many that I enjoy now and then, I have very few that I have signed up to receive a notice of every post. Not Just Cute is one of those. I encourage you to consider it as a regular as well. Categories: Child Development, Parenting | Permalink.